Over the last year 3 years I have been experimenting with different Keto strategies to better understand their effects on the body and which ones I respond to best. Earlier this year I started experimenting with Carnivore and have continued to experiment with it over the course of the year. During this past year I have changed my opinion on Carnivore a lot. I now think that it is a pretty great elimination diet that can be used to shred up and restore gut function. I now use it as a tool when I need it. One of the big shifts in thinking I have had is about organ meat. I now view organ meat as an absolute staple in a Carnivore diet and really it would provide a lot of benefit in a standard Keto Diet or any diet really! Back in the hunter and gatherer era each aspect of the animal was utilized, not simply the muscle and fur but the organs too! In fact, organ meat was considered a delicacy. Now we typically just eat the muscle of animals and neglect the organ meat. Not only is this wasteful, but we’re getting rid of high quality protein sources rich in micro-nutrients. What are the Different Types of Organ Meat? 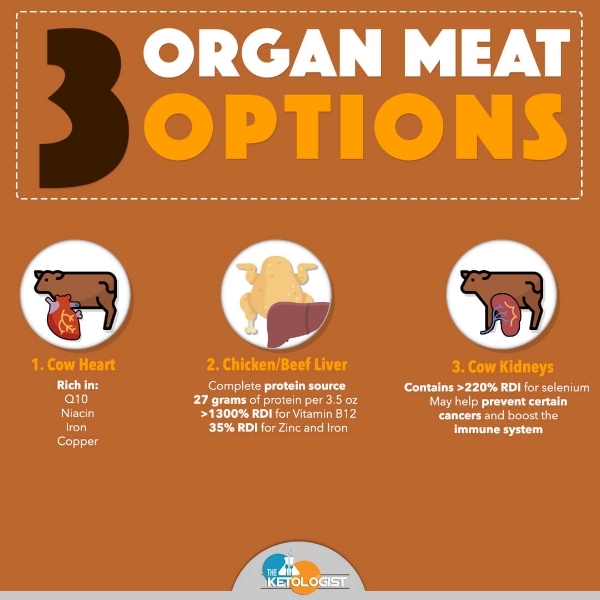 The most common types of organ meat include liver, heart, and kidneys. The most common animal sources include chicken, cow, pig, lamb and goat. Liver is one of the more popular of the organ meats. Liver helps detoxify the animals body and also happens to be the most nutrient dense of all organ meats. A 3.5 ounce serving of beef liver contains 25 grams of protein and over 1300% of the RDI for Vitamin B12! Additionally, liver is also high in iron, copper, vitamin A and niacin. Collectively, these nutrients reduce oxidative stress (vitamin A) and provide a cardio protective effect (vitamin B) (2). The heart is typically known for being one of the tastier organ meats. Like the liver, the heart is a great source of vitamin B12. Additionally, the heart has >50% of the RDI for riboflavin. What’s special about the heart (especially cow heart) is it contains coenzyme Q10. Simply put Q10 helps generate energy in the cells. Additionally, Q10 also functions as an antioxidant, protecting the cells from free radicals and oxidative stress. Research has shown that low levels of Q10 is linked with heart disease, diabetes and cancer. Whereas, supplementing with Q10 has been shown to improve exercise performance and may even reduce the severity of migraines through its improvements in mitochondrial function (3,4). Another popular organ meat consumed that is also nutrient dense are kidneys. Kidneys function to filter waste and toxins out of the blood. Kidneys are typically rich in vitamin B12 and selenium. In fact, cow kidneys have over 200% of the RDI for selenium. Selenium appears to improve blood flow which leads a variety of beneficial downstream effects including improved immune function, metabolism and antioxidant capacities (5). Other popular organ meats include the tongue and brain. While cow tongue is a popular appetizer for many, it is actually the most calorically dense organ meat at around 250 calories per serving. Additionally, tongue contains vitamin B12, niacin, and zinc however, in smaller concentrations compared to other organ meats. Lastly, brain meat is known for its large quantities of cholesterol. Per 3.5 oz. brain meat typically contains >1000% of the RDI for cholesterol. While, we now know that dietary cholesterol intake may not have as great of a risk of heart disease as once thought, it should still be taken into account when selecting your organ meats! Organ meats are regarded as safe for human consumption however, as with most meats you should look for grass-fed/finished to ensure you are getting the highest quality. If the animal has been eating garbage than the benefits from organ meat are not going to be experienced. Ensuring good sourcing can also make consuming the organ meat a lot safer. I’m working now to perfect this and will be sharing with you soon. So far I have cooked beef heart and liver. The liver I was able to make pretty good, the heart not so much. It is important if you are cooking it that you do not fry away all its nutrients. Be on the lookout for more info on cooking organ meat as I continue to practice. Organ meats are rich in purines and vitamin A, individuals with gout and or are pregnant should monitor organ meat intake (6). For some there is a concern that organ meats may store toxins which is why they stay away, however, this is not the case organ meats are in-fact safe and nutritious (7). It is worth noting that some organ meats such as intestines can contain harmful bacteria if not cleaned properly and brain could contain harmful diseases so it is important to consider your source! In conclusion, organ meats are a great source of high quality proteins! Organ meats can help you pack on the lean muscle mass and keep you satiated. Additionally, as organ meats are rich in vitamin A, B12, Choline, selenium, riboflavin and Q10 they can offer a variety of health benefits including reduced oxidative stress, improved blood flow and immune function, and even exercise performance!